The Kern River Watershed Coalition Authority (KRWCA) is a joint powers authority, established to serve as the coordinator and coalition (third-party) group under the Irrigated Lands Regulatory Program (ILRP) in the Kern River watershed portion of the Kern County. On February 4, 2014 the Central Valley Regional Water Quality Control Board (Water Board) issued a Notice of Applicability (NOA) to the KRWCA, approving the KRWCA to represent member owners/growers of irrigated agricultural lands within the KRWCA boundary under the ILRP. Winter 2019 Annual Grower Education Meetings Were Held In December 2018/January 2019 - Three identical grower education meetings were held in on December 17, 2018 in Buttonwillow, January 8, 2019 in Bakersfield, and January 10, 2019 in Wasco. These meetings focused on Nitrogen Management Plan Worksheets, Farm Evaluations, and Nitrogen Management Summary Reports (due March 1, 2019, no exceptions). 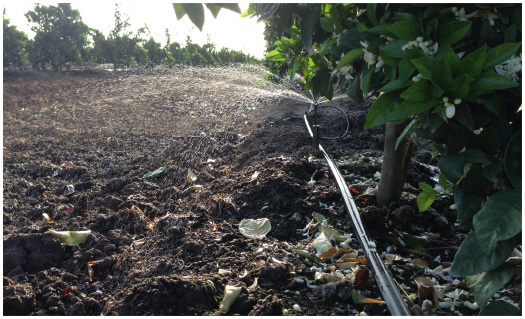 General Guidance on the Timeline Requirements for ILRP Nitrogen Management Plans for Citrus Crops (PDF)– A guidance document developed to help citrus growers understand and visualize the timeline and due dates of the annual ILRP NMP Worksheet and NMP Summary Report. Farm Evaluation (PDF) – Reminder: Farm Evaluations for all farms located within a high vulnerability area are due on March 1, 2019. Please complete Farm Evaluations for the 2018 crop/harvest year and submit through ILRP Farm. Nitrogen Management Plan Summary Report (PDF) - NMP Summary Reports for ALL farms (large and small) with parcels designated in a high vulnerability area are due on March 1, 2019. The NMP Summary Report summarizes the information from the 2018 NMP Worksheet, and MUST be submitted through ILRP Farm. Nitrogen Management Plan Worksheet (PDF) – The NMP Worksheet for the 2019 crop/harvest year is due on March 1, 2019 for ALL farms. Note: CERTIFICATION IS REQUIRED for farms designated within a high vulnerability area. All farms within low vulnerability areas must prepare a NMP worksheet as well, but do not need to certify the plan. Reminder, the NMP Worksheet remains on the farm and is NOT submitted to the Coalition. - List of Certified Crop Advisors (CCAs) – CCAs must have a California Nitrogen Management Specialty certification.